I am aware that several firms have now adopted an Unlimited PTO policy. If you are considering this type of policy for your CPA firm, I want to share some very interesting insights from someone who has experienced unlimited PTO first-hand. He is an audit manager with a firm in the western part of the USA. I hope you find his comments helpful if you are considering adding this benefit. My current firm does not have unlimited PTO, but I have worked at firms that did. I can’t offer a written policy – there really wasn’t one – but I can offer some considerations, most of which you probably are already aware. First, doing away with traceable measures (PTO available/used) demands reliance on other performance measures to determine whether the unlimited policy is being abused. Partners/managers need to pay closer attention to metrics at the individual employee level. Regularly reviewing metrics such as individual realization, time-to-completion, deadlines met (or missed) as well as the timing of PTO days taken becomes essential. Be sure your practice management system can provide that information before enacting the unlimited policy. Also, the policy assumes that everyone will “do the right thing.” Be aware that not everyone will do the right thing and be prepared to take action against those that abuse the system. If you allow unchecked abuse, it will become rampant. In an unexpected twist, you may need to actually force some people to take PTO. Without the pressure of the old use-or-lose policy, some of those Type A folks will be more inclined, or more pressured, to work instead of taking time off. I’m sorry I can’t cite a specific study, but there is some evidence that the unlimited PTO policy actually results in less time away from the office. Finally, be aware that some states (California and Washington, for example) have passed legislation regarding required sick leave. This is a number that may, by law, require tracking and that might throw a wrench in your unlimited policy. There are typically exceptions if your leave policy is more permissive. And the standard disclaimer: check with your state or your employment law attorney before changing your policy. I recently read an interesting article in CPA Practice Advisor. It is titled, Virginia CPA Firm Launches Extensive Employee Benefits and Perks Program. Some of their benefits and perks are things I have observed often in other firms. On the other hand, some of their benefits and perks are way ahead of many firms. In this age of hiring, developing and retaining talented young professionals, you need to review your benefit package often and keep pace with current trends. Read the article and see how your benefits stack-up. My observation and experience tell me that a long list of perks won’t keep talented professionals at your firm if your leadership group is dysfunctional and doesn’t set an inspiring, professional example. When I was working inside a successful, growing firm, we did a state of the firm event every year. We brought everyone together from our three offices for a full morning of information and fun. It was a great time for people from different offices to see and talk to each other face-to-face. Our team seemed to enjoy hearing about the progress of the firm and news about what might happen in the future. It was held in the Spring, usually in May. We had just over 100 people. This morning I read an article about Withum’s annual SOTF event where they bring together over 1,000 people! They hold theirs in January. Read all about it here. It is my observation that people working in an accounting firm want to be included. They want to know what’s going on and how the firm is doing. It is a great recruiting and retention tool. Your people read about these events at other firms and probably wonder why their firm isn’t doing it. Virtual CPA firms have been evolving for many years now. Many have gained much notoriety and a substantial client following. I enjoyed reading this article about my good friends at Beach Fleischman, a Top 200 firm based in Tucson, Arizona. The joined forces with a smaller firm to create a virtual firm, MOD Ventures, that will service both firms’ outsourced accounting services clients going forward. Read all about it here, via Accounting Today. Maybe it will motivate you and your firm to become more creative and take advantage of virtual opportunities. Thanks to Charles Hylan for sharing some information from this year’s Rosenberg Survey. Each year The Rosenberg Survey does an analysis to see which metrics have the strongest correlation to profitability, as measured by income per partner. As we work with firms who are struggling with profitability, we start by looking at their various leverage ratios followed by comparing their rates to like-sized firms in like-sized markets. 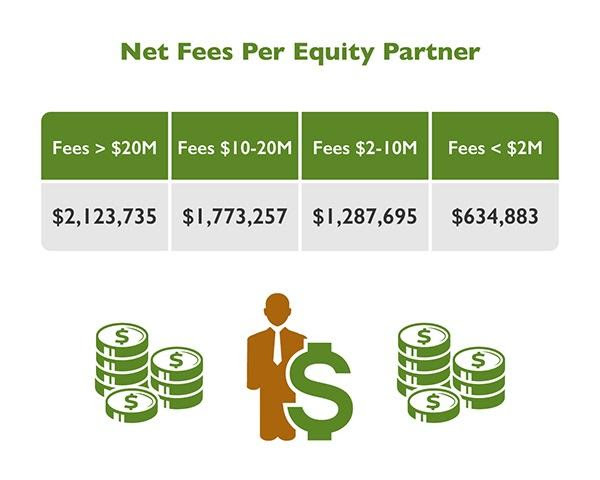 One very important leverage ratio is net fees per equity partner. CLICK HERE to Order the Survey! Are You Getting Two 4-Day Weekends? Some of you are getting some extra time off this holiday season. I did a casual survey to see what CPA firms were doing about giving their teams time off since Christmas and New Years falls on Tuesdays this year. 17% will close their offices for two 4-day weekends. Both New Year’s Eve and Christmas are holidays. 56% will close Christmas Eve and Christmas Day and be open on December 31. 11% will close one-half day for Christmas Eve and a full day for Christmas and New Years Day. 16% will be closed only for the traditional holidays – Christmas and New Years. Several firms noted that many people will take PTO to extend their holiday time but the firm offices will be open. I periodically ask questions to a group of CPA firm administrators and HR directors. If they respond to my question, they receive a summary of all of the answers from various firms around the country. If you would like to be part of my “Advisory4Keller” group, email me and let me know. 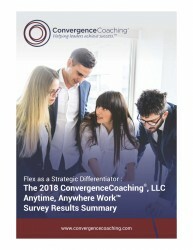 Last week, ConvergenceCoaching, LLC released their 2018 Anytime, Anywhere Work™ Survey. Today’s talent wants to integrate work and life. As a result, leaders must continually find ways to innovate workplace flexibility. The goal of the survey is to collect data on CPA firm adoption of flexible work programs and the experiences firms have had with these initiatives. Firm leaders need to thoughtfully contemplate how enhancing a more flexible workplace can be a huge benefit to the future of the firm. Download the survey summary here. Income per Equity Partner (IPP) is one of the top measurements of overall firm profitability. Our analysis of IPP over the past 10 years is below. Take a look at the findings in the 2018 Rosenberg Survey (based on 2017 data) and see what metrics drive profitability. This information comes from The Rosenberg Survey. It provides a lot of good information. You can order yours here. Here is his list of perks and extras offered by The Best. Be sure to read his post to learn more about each perk. Follow Dan on Twitter. I have found that several of these are offered by many firms, large and small. The one I wish more firms would address is the last one – a true commitment to remote work. Dispirited, unmotivated, unappreciated workers cannot compete in a highly competitive world.